A grid dip meter is, in it’s simplest form, an oscillator. One function of this device is to determine what frequency, or frequencies, a particular LC circuit is tuned to. This is accomplished by placing the device in close proximity with the LC circuit under test. 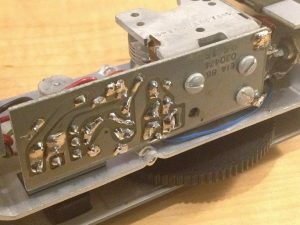 Inductive coupling between the meter and the circuit being tested allows the resonant frequency to be measured. When the frequency of the meter is tuned to the frequency of the LC circuit under test a dip will be observed on the meters indicator. More information about how to use this device can be found on YouTube in a video by Alan, W2AEW. I thought it would be interesting to take this little meter apart and see what’s inside. 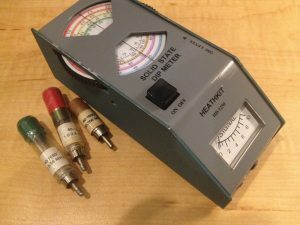 While most of us are familiar with how to use one of these meters, and what they look like on the outside, I’m guessing that unless you’ve assembled one of these nifty devices yourself that you won’t be quite as familiar with the parts inside. In the photographs you will see some familiar components. The large device with the moving interweaving plates is the variable capacitor. This capacitor, along with the inductive probe chosen sets the frequency of the oscillator. 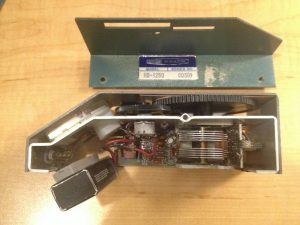 Other big ticket items include the battery on the left, the variable potentiometer to set the gain of the front panel meter seen with the small thumb-wheel attached, and the single-sided circuit board on the bottom. I admire the simple sheet metal construction of these Heathkit devices. Their simplicity certainly contributed to their low cost, and high availability that made the Heathkit line so popular. I found the method they used to create a tapped mounting hole in the edge of the sheet metal to be particularly clever. This is a technique I could certainly use in the future. The single-sided pcb in this meter looks like it was likely drawn by hand. This semi-artistic method of pcb design has gone by the wayside in favor of modern CAD software, but you can still learn a lot by studying these designs. I can appreciate the quality of the work here, especially considering it was done on paper.